UV is Ultraviolet radiation, an energy band within the electromagnetic energy spectrum. Its wavelength is between that of visible light and x-rays and it has been found to be an effective method for destroying germs in a water supply. At a 254nm wavelength, UV reaches its peak germicidal effectiveness against most microorganisms. 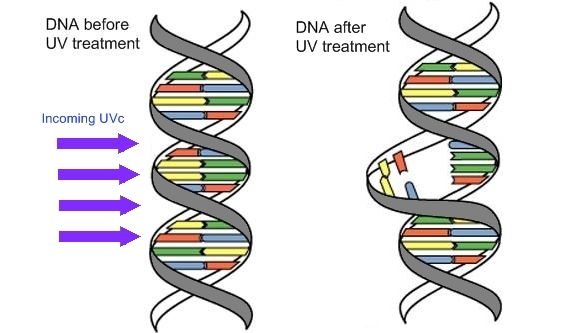 UV destroys germs causing a molecular change in their DNA makeup. This prevents germs from multiplying and destroys the ability to spread disease. When germs cannot multiply, they are considered dead. Ultraviolet purification is a chemical-free solution to killing the bacteria in your water. It uses a UV light source (lamp) which is enclosed in a protective transparent sleeve (usually quartz). The lamp is mounted such that water passing through a flow chamber is exposed to the UV-C light rays. When harmful microbes are exposed to the UV rays, their nucleic acid absorbs the UV energy, which then scrambles the DNA structure of the organism. The cell is rendered sterile and can no longer reproduce. The cell is now considered dead and is no longer a threat. Ultraviolet or UV energy is found in the electromagnetic spectrum between visibile light and x-rays and can be best described as invisible radiation. In order to kill microorganisms, the UV rays must actually strike the cell. UV energy penetrates the outer cell membrane, passes through the cell body and disrupts its DA preventing reproduction. The water should be clear and free from particles. The use of a pre-filter is recommended, please see our range of filters for more details. UV water treatment does not alter water chemically; nothing is added except energy. The digree of disinfection by Ultraviolet radiation is directly related to the UV dose applied to the water. The dosage, a product of UV light intensity and exposure time, is measured in millijoule per square centimeter(mJ/cm2). Most UV units are designed to provide a dosage greater than 30mJ/cm2 after one year of continuous operation.